This is an excellent story about Melanie, a very special little girl, in a dystopian zombie filled world. Yes my friends, I said the magic word: Z O M B I E S! Melanie is a gifted 10 year-old. We meet her right away and it is impossible not to sympathize with her, as all the cruel and daily challenges she has faced all her life are revealed. The world in which Melanie lives is so much different than our actual world. The human race is becoming extinct as the “hungries” a.k.a. the zombies, take over the world. But the hungries are not the only danger for human kind. There’s also Ophiocordyceps, a fungus that is slowly taking over the world. I won’t say anything more about the plot because I don’t want to spoil your fun. But it’s good. It’s captivating from the get go. This is a dark story filled with contrasts. It is scary, disgusting and gruesome at times, but it also has disturbingly endearing moments that make this an enjoyable reading ride. This is not your normal zombie story in which they are the abominable monsters that must be destroyed. Yes my friends, this book actually makes you consider and reflect on what would happen if the story was the other way around. Another thing I like is that it is a realistic plot and the characters. I gave this book a raiting of 4 out of 5 because there were a couple of details that didn’t quite do it for me. More about this on the full review on my blog. 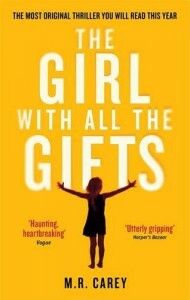 The Girl with all the Gifts is a perfect summer read. Read this book if you’re into zombies. If you’re into thrilling horror dystopian science fiction stories, this is the book for you. If you’re in the mood for a story that will creep you out but you won’t be able to put down this is the book for you. If you like to read books before they are tuned into movies this is the book for you. Yes, this book’s movie is under production. Glenn Close is part of the cast for the film. You have time to read it before it hits theaters in 2016. I received an Electronic copy of this book but was not financially compensated in any way nor obliged to review. The opinions expressed are my own and are based on my personal experience while reading it. This post contains affiliate links.